There was a kid sitting there by himself, a freshman. He put his bag down on the seat beside him, then looked the other way. All down the aisle, anybody who was sitting alone moved to the edge of their seats. Park heard Tina snicker; she lived for this stuff. The girl looked like exactly the sort of person this would happen to. Not just new—but big and awkward. With crazy hair, bright red on top of curly. And she was dressed like … like she wanted people to look at her. Or maybe like she didn’t get what a mess she was. She had on a plaid shirt, a man’s shirt, with half a dozen weird necklaces handing around her neck and scarves wrapped around her wrists. She reminded Park of a scarecrow or one of the trouble dolls his mom kept on her dresser. Like something that wouldn’t survive in the wild. That was Park’s first impression of Eleanor. Although he wants nothing to do with her, he’s a decent person and he hisses at her to take the seat beside him when the kids at the back of the bus start openly taunting her. She continues to sit with him every day on the way to school and back, but they remain silent. When Park notices her reading his comics along with him, he slows his reading and then brings a stack of comics that he silently leaves on her seat. From there, a tentative friendship begins, and that friendship quickly turns into romance. Rainbow Rowell tells the story of Eleanor and Park’s romance through a series of vignettes that alternate between Eleanor and Park. We see the disastrous home life that Eleanor tries to hide from everyone, including Park. We see the pressure Park’s is placed under by his family and his genuine, bewildering affection for Eleanor. The romance between them is sweet, even if the story is not. Eleanor’s life—in which she shares a single bedroom with four siblings and lives in fear of being kicked out again by her stepfather—is too harrowing for this to be a sweet story. Her relationship with Park is the one good thing in her life. The novel is set in 1986, which is awfully close to when I turned 16. 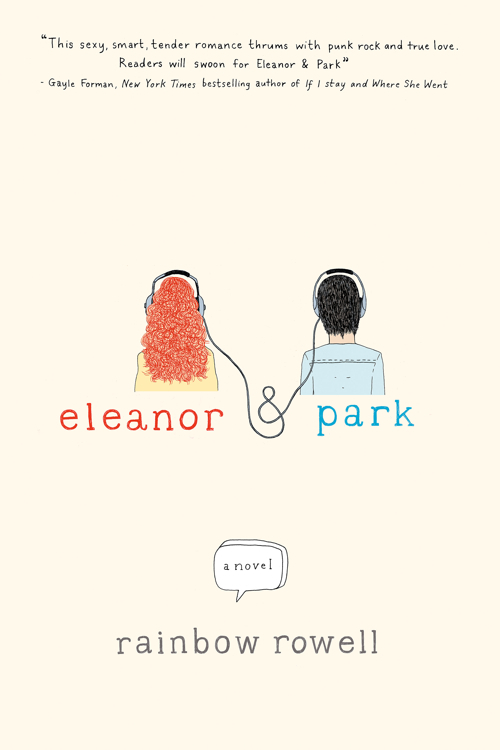 That made the pop culture references and descriptions of clothes and cars and mix tapes particularly fun, although I have to say that Eleanor and Park’s interests in comics and alternative music were far cooler than my generally ordinary interests in sitcoms and top-40 music. I might have heard of The Smiths, but I didn’t know the first thing about how to find such music—nor did I know I might enjoy it. That’s a big difference between 1986 and today. It’s a lot easier to find quirky stuff to like and people to like it with now. Eleanor called the song lyrics and band names on her notebook a wish list—things she’d heard of and thought she’d like if she got a chance to hear them. Today, the Internet would bring it right to her, if she could find a way to log on. In 1986, she had rely on Park’s mix tapes. This is a charming book. It’s written for a young adult audience (or at least marketed as such), but that shouldn’t put off adult readers. (Honestly, I don’t think adult readers should ever be put off young adult books if they sound appealing. Laurie Halse Anderson, for example, writes as well as any “adult” author.) If it sounds like the kind of story you’d enjoy, you probably will, even if you’re not a teenager anymore. I’m hoping to read this one next week. Yours is the 2nd rave review I’ve read in the past week. Nice job. I had read several good reviews the last couple of months from trust-worthy sources, so I had to give it a try. I hope you enjoy it as much as I did. I’m going to send the details of this to our Secondary Trainee Teachers. They should definitely know about it. It’s a good one for school libraries (although maybe not whole classroom reading). It handles tough issues really delicately and gets a lot of the feelings of being at that age just right. This sounds like an amazing book, and I suspect I might identify a bit with Eleanor (not that my home life was that troubled). I had to laugh at your A-Team research. It’s available on Netflix, and I really do not want to watch it, but I feel this awful nostalgic pull toward late 1970s and 1980s TV. I certainly could relate to Eleanor’s feelings about her body–I think a lot of girls would because these days even girls who aren’t fat are made to feel fat. The fact that Park loves her, and quite specifically loves her body, is a nice thing. I loved this book – as you say, it’s very charming and captures the feeling of falling in love for the first time perfectly. I really liked how she handled both the emotional and the physical feelings and the way romantic relationships rub up against all the other relationships. It’s so well done. I *did* the remember the A-Team as a Friday night show, which is hilarious considering everything in my life that I don’t remember. I was so touched by Eleanor’s list of bands she thought she would like. In the 80s I was really into music but I lived in a tiny town in rural Maine and it was SO HARD to find some of the music I wanted to hear, so I really felt her pain. Everything about this book was just wonderful and I highly recommend the audiobook version. Friday tended to be a movie night at my house, which is probably why it fell off my radar when it moved to Friday. That list was such a neat detail. Like you, I grew up in a rural area and a lot of stuff was out of reach. For me, it wasn’t bands, but live theatre, especially musical theatre. I would get cast albums out of the library and make tapes of them to listen to over and over, but they mostly had older musicals, nothing new. And it wasn’t the same as seeing the shows. Can’t wait to read this. I loved Attachments and already have my library hold placed on Rowell’s upcoming Fangirl. And I see on her website that she’s got another book coming in Spring 2014 – busy woman! I’ve heard mixed reviews of Attachments, but I liked this enough to give it a try and to look out for more of her books. I read and reviewed this one, too, and liked it. I was annoyed by the cover art, on which Eleanor is clearly not big at all. I got the impression from the book, though, that she wasn’t actually fat, just taller and more solidly built than the cheerleaders, but at that age she would have felt herself to be enormous and would have been considered fat by the other kids. (At one point, I think, Park’s father is puzzled by the nickname Big Red, because he doesn’t think she’s big.) I could be wrong on this, though! Yes, you’re right about the cover art. I hadn’t noticed it because it’s just the backs of their heads, but she’s the same width as Park. That seems wrong. In the post that I linked to, Rainbow Rowell said she left Eleanor’s precise size ambiguous but that she is indeed fat. Just how fat is unclear–probably not as fat as she sees herself but not a teenage girl who feels fat because she’s a size 6 rather than a size 2. Park’s descriptions of her body emphasize her roundness, so the text supports that. I missed the bit about Park’s father but Rowell mentions it in her post. My guess is that an adult man would have a different view on what would make a woman look “big” than a teenage boy would, so there’s room for multiple ideas regarding what he pictured. I didn’t click through to the post you linked to, but I will! I like that she left it ambiguous, also. I definitely wasn’t thinking size 6, but more of a size 12. If she was what an adult man would see as “fat”, then that makes the high school romance between her and Park too unbelievable to me! I enjoyed this one very much, and I’m glad you did, too! It was so good–it’s great to see so many people embracing it! After our conversation about 1980s TV shows, that A-Team thing is hilarious! Dave added Buck Rogers to the list of 1970s/80s sci-fi shows, by the way. And that’s another one I didn’t watch, although I remember it existing. I was such a late adopter of sci-fi. I think I saw it as my brother’s turf. Why that didn’t apply to The A-Team I have no idea. From what I remember, it was a family show for us. Everyone loves this book so so so much. Is it possibly one of those things where I will be disappointed because it got hyped too much? You think? It’s certainly possible. It’s not the best book ever or anything, but it is a good book. Once hype gets to a certain point, I always assume I’ll be disappointed, so it’s a pleasant surprise when I’m not. Rainbow Rowell has been attracting me for soooooo long! Then I finally read Eleanor and Park-and l o v e d it!I’m really excited to read Landline and if you haven’t really read Attachments!